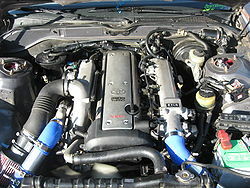 Third Generation 1JZ-GTE VVTi in a 1989 Toyota CressidaThe 1JZ-GTE employs twin CT12A turbochargers arranged in parallel and blowing through a side-mount or front mount air-to-air intercooler . With an 8.5:1 static compression ratio, the factory quoted power and torque outputs are 280 metric horsepower (210 kW) at 6200 rpm and 363 newton metres (268 ft·lbf) at 4800 rpm respectively. These motors are over square (86.0mm bore x 71.5mm stroke). Yamaha may have had a hand in the development or production of these motors (possibly the head design), hence the Yamaha badging on certain parts of the motor, such as the cam gear cover. In 1991, the 1JZ-GTE was slotted into the all-new Soarer GT. The early generation 1JZ-GTEs combined the inherent smoothness of an inline 6 cylinder engine with the revving capacity of its short stroke and early power delivery of its small, ceramic wheeled turbochargers. The ceramic turbine wheels are prone to delamination in the setting of high impeller rpm and local temperature conditions, usually a result of higher boost. The first generation 1JZ's were even more prone to turbo failure due to there being a faulty one-way valve on the head, specifically on the intake cam cover causing blow-by to go into the intake manifold. Also on the exhaust side a decent amount of oil vapor flows into the turbos causing premature wear on the seals. The later 2nd Gens had this problem fixed and in Japan there was actually a recall in order to repair the 1st Gens, though that does not apply to 1JZ's imported to other countries. The fix is simple, and involves replacement of the PCV valve (2JZ); all parts are available through Toyota. The "third Generation" of 1JZs were introduced around 1996, still as a 2.5 turbo, but with a reworked head incorporating Toyota's newly developed continuously variable valve timing mechanism (VVT-i) , modified water jackets for improved cylinder cooling and newly developed shims with a titanium nitride coating for reduced cam friction  . The turbo setup changed from parallel twin turbo (CT12x2) to a single turbo (CT 15B). The adoption of VVT-i and the improved cylinder cooling allowed the compression ratio to be increased from 8.5:1 to 9.0:1, making the 1JZ-GTE an interference engine. Even though the official power figures remained at 280 metric horsepower (210 kW) at 6200 rpm, torque was increased by 20Nm to 379 newton metres (280 ft·lbf) at 2400rpm. These improvements resulted in increased engine efficiency that reduced fuel consumption by 10%. The adoption of a much higher efficiency single turbocharger than the twins as well as different manifold and exhaust ports were responsible for most of the 50% torque increase at low engine speeds . This engine was used primarily in Toyota's X chassis cars (Chaser, Mark II, Cresta, Verossa), the Crown Athlete V (JZS170) and in the later JZZ30 Soarer, as the JZA70 Supra was long discontinued by this time.